Vivre O Canada Immigration is one of the largest immigration consulting firms in Canada. It is based in Montreal, Quebec and with offices in many countires. In the Philippines, Proactive Immigration Advisers Corp is their exclusive representative. During the visit of Ms. Nora Bouhali (Vivre President) and Atty. Stephane Hebert (VP of Vivre), in September 2013, they were invited by Mr. Apol E. Apuntar, PIA Corp President to visit and see The Sisters of Mary School campus in Silang Cavite. The Sisters of Mary School offers free high school education and vocational training to poor student. It is being funded through donations from various individuals and instituions worldwide. FACFI is their local funding arm. Upon seeing the program, Ms. Nora immediately made a commitment to help the school --- starting October 2013, a portion of their professional fee will be donated to FACFI. On November 7, 2013, PIA Corp and Vivre O Canada donated P43,120 to Fr. Children's Foundation Inc (FACFI). 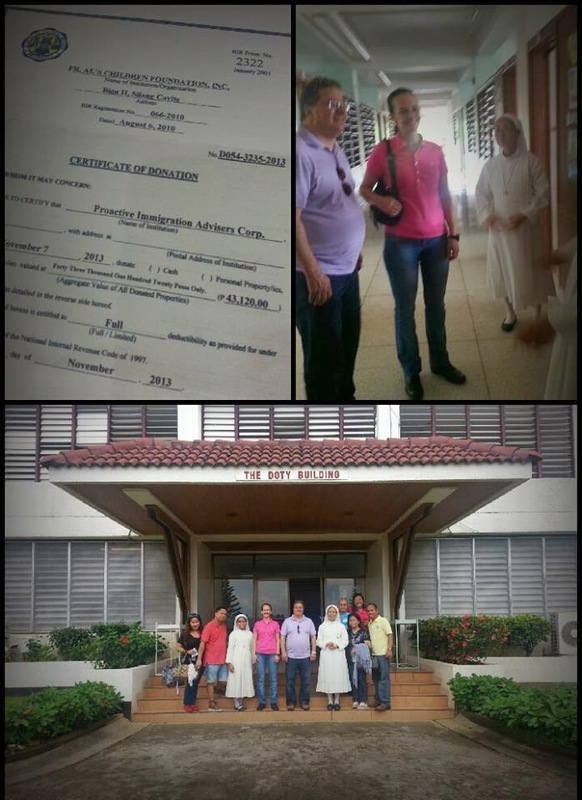 In May 2013, PIA Corp officially adopted Fr. Al's Children Foundation, Inc (FACFI) as the institution it will help in line with its corporate social responsibility program. PIA Corp and Vivre will make a monthly donation to FACFI! For those who want to help poor students get free high school education and vocational training may visit http://www.facfi.org.ph/ for more information on how to help.